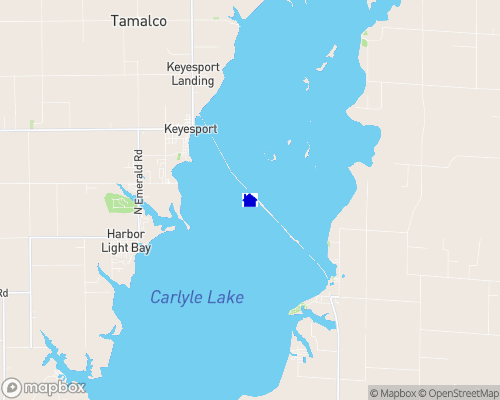 Carlyle lake is the largest manmade lake within Illinois with more than 26,000 acres of water and 11,000 acres of land. It is located just 50 miles east of St. Louis, Missouri. Carlyle Lake offers tremendous recreational opportunities. Carlyle Lake is known as one of the top waterfowl hunting areas in the state. From Nov. - Jan. there is a controlled Pheasant hunt at Eldon Hazlet State Park. The Department of Natural Resources also provides opportunities for hunting white-tailed deer, turkeys, squirrels, bobwhite quail, rabbits and mourning doves. Trapping is permitted after the duck season. Birdwatchers can view ducks, geese, bald eagles, ospreys, cormorants, and great blue herons, as well as numerous species of shorebirds and songbirds. There's swimming beaches, camping areas, including two state parks, golf courses, great restaurants and nightlife. The tailwater (below the dam) is the most productive fishing area in Illinois, producing 3,260 lbs. of fish per water acre. The state record flathead catfish and white bass have been caught in the spillway. Carlyle Lake is well known to sailors as one of the best and most challenging lakes for sailboats. The lake was host for the 1994 U.S. Olympic Festival Sailing Competition. There are sailing races almost every weekend through the summer. Boats and watercraft of all types are suitable for use on the lake.